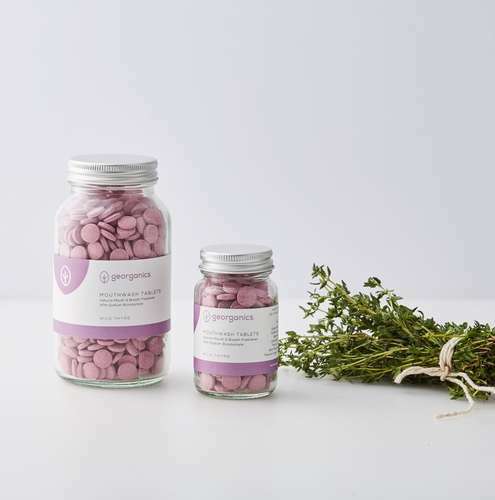 Georganics mouthwash tablets are made from entirely natural, food grade and non-toxic ingredients and offer an effective alternative to conventional mouthwash. The tablets have a fluoride, glycerin and SLS free formula which help to restore a healthy pH balance to your mouth, maintain good oral health and freshen your breath. These tables are spearmint flavoured and are perfect for travelling and are a more eco-friendly alternative to traditional mouthwashes avoiding the unnecessary transportation of water. Choose between a glass bottle containing 180 tablets (3 months supply) or 720 tablets (12 months supply). Directions of use - Place 1 tablet in a glass with around 20ml of water and allow tablets to completely dissolve. Gargle for around 30 seconds, then spit out. Ingredients - Sodium Bicarbonate^, Tartaric Acid^, Sodium Benzoate^, Natural Colourings*^, Menthol^, Thymol^, Spearmint Flavouring*^. *Natural Origin, ^Food Grade. *Organic Farming, ^Food Grade. Product Packaging - Glass jar and aluminium lid.